An e-commerce jewelry design company came up with an interesting tagline to promote their designs and style. The line read “Life is too boring to wear boring jewelry.” Isn’t it true? The world’s no less than a race track and every global citizen is on the run. In order to make it big in the world of jewelry, it is important that you remain visible throughout and are able to sell your jewelry because you simply can’t afford to remain hidden. Technology isn’t an alienated term anymore. No matter which business or level of business do you fall under, you ought to make it huge in this tech-oriented world to gain that extra edge over your competitor’s. Websites definitely are a way out to advertise and make known of your existence to the world beyond physical. Much cheaper than their mobile app counterpart. Yet, they aren’t capable of passing on the kind of value and benefits that mobile apps have managed to pass on to their users. Imagine a situation – I am new to the city and have not really explored any proper store. Now I am in a fix because there’s an office party and I need some elegant jewelry to go with my outfit. Well, the first thing I would do is search for an e-commerce jewelry website, browse through their offers and finally make a purchase. This would have been the scenario till maybe a few years before. Today, searching on a website would be a secondary option, the primary and the quickest thing to hit me is to check the play store, install a jewelry app and make it happen soon. The reason? There are so many! A onetime download program and I get to shop from my favorite store while on the go or while doing almost anything, anywhere. Exactly what millennial like I look forward to – pace! 1. Widespread Clientele: A limited customer reach – this is the most conventional drawback of a physical jewelry store. With a permanent location, you may be able to cater a certain niche in an area but this may not help you expand and improve your brand image. With a mobile app, you can break these location-based barriers, widen and improve your clientele. With over 70 percent of urban citizens using a smartphone and becoming dependent on mobile apps, here’s your chance to stay ahead! 2. Convenient Shopping Option: As mentioned above, a majority of your potential audience is dependent on their smartphones for almost everything. This factor alone forces jewelry business owners to opt for business mobile apps since it offers a convenient shopping option. Everything is just one touch away and if you can assure them secure payment options, you’re in for some commercial luck. 3. Quick Sales: Just like you complete a sale in your physical store, the mobile app is yet another point of sale in your business realm. In fact, it makes a faster, quicker and safer option combined with the comfort factor that is associated with the app. Customers can get a detailed break up of all the costs involved and this fosters better relations between the seller and the buyer. 4. Know your client’s preferences: When a client is visiting your store, they make a quick purchase and leave. There isn’t much of a quality customer-seller interaction. This isn’t true in case of a mobile app. When a buyer makes a purchase, it becomes easier for the seller to understand their requirements and align the designs as per their need. You will have access to their location, contact number and some more information that will help you create a brief idea about the customer. Touch navigation has helped sellers to understand the patterns followed by their individual customers. This detailed analysis of a customer’s preference will help the seller to customize the offering made to the customer while they are shopping or when they return again. 5. Faster Access: Mobile app functionalities have redefined the speed factor which websites have created. It takes barely a few seconds to connect with the app and the concerned product. This ensures faster access and better viewing of jewelry designs. So no matter what the occasion is, there is a whole lot that can be done within a few minutes. 6. Cost Factor: Opting for a traditional advertising pathway, let me warn you, it’s expensive. 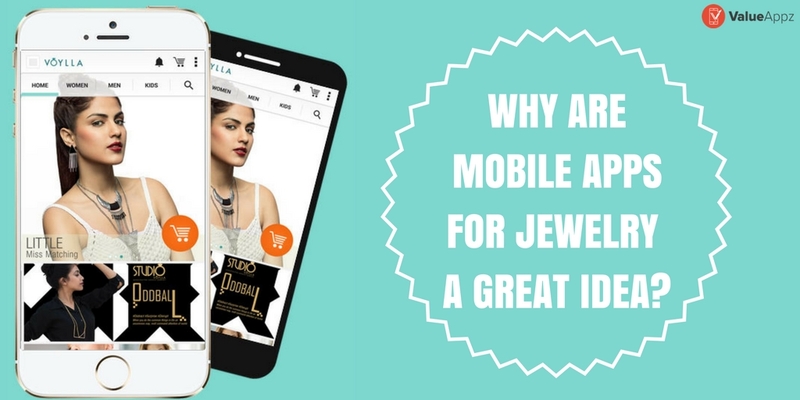 Looking at the kind of brand image a mobile app can create and its widespread reach, it proves to be a cost-effective tool and with a lot many value-based mobile app packages, it becomes all the more easy to have an app to promote your jewelry business. Customized mobile apps may seem to be an expensive affair but with solution oriented packaged apps creating better opportunities for businesses, you can always look beyond the cost boundaries. The market’s tough and you have to fight it to survive and succeed. A mobile app passes a cutting edge and this will help you boost your sales figure, improve your brand image and connectivity. If you are planning for a business mobile app for jewelry business, don’t give it a second thought. It’s a risk that doesn’t harm you. You simply need it to create an impact. Want to check out some really strong codes that can give your jewelry business a facelift? Drop us a line right away at info@valueappz.com. At ValueAppz, get the best possible packaged mobile app solutions created by experts with more than 400 app success stories to their credit. 90% of your problems can be solved by marketing. Solving the other 10% just requires good procrastination skills. I’m a digital strategist, and I believe that unique businesses deserve unique strategies to succeed online… and I love coming up with ideas to match your ambition. I’m indifferent to most items on the planet. How to Add Features like Grofers’ and Bigbasket’s for Your Grocery Mobile App?